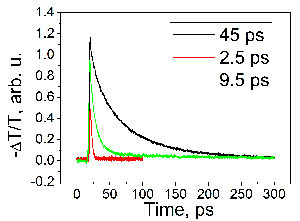 For the measurement of the electrical transport dynamics in the semiconductors, nanocrystals, and other materials on the picoseconds time scale, optical pump - THz probe technique can be used. THz radiation emitter and detector for the measurements are made as dipole antenna on LTG GaAs layer and are activated by the parts of Ti:sapphire laser beam. 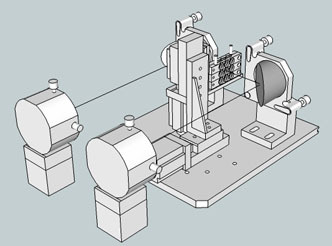 The third part of the same laser beam is used for the photoexcitation of the samples. Excitation levels up to 100 nJ/cm2 can be achieved; excitation levels up to 2 µJ/cm2 can be achieved using the metallic aperture with the diameter of 300 µm. Both - optical pump and THz probe beams overlap at this aperture. Fig. 1 Optical pump THz probe experiment scheme. The dependence of the THz transient signal at its maximum amplitude is measured at different delays of the optical pump pulse. Fig. 5 shows the temporal dynamics of the optical pump induced change in the transmittance at THz frequencies measured by this technique. Fig. 2 Electrical transport Dynamics of the different GaAs samples. 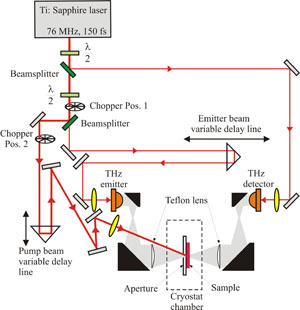 Temporal resolution of this experiment is determined by the response of the detector measuring THz transients and is approximately equal to 1-1.5 ps. Maximum temporal range of the experimental setup is 600 ps (limited by the optical delay line length). The measurements can be done in transmission or reflection geometry and wide temperature range (from 10 to 300K). Electromagnetic radiation in the terahertz frequency range (0.1 THz - 4 THz) has many important applications in the areas of spectroscopy, detection, and security. Fig. 3 THz-TDS spectrometer "T-Spec". In the "T-Spec" spectrometer (Fig. 1) few-cycle THz pulses are generated by exciting an electrically biased photoconductive dipole with an ultrafast laser pulse (<100 fs). The resulting photo-generated current responds on a picosecond timescale and leads to THz electromagnetic pulse radiation. High-resistivity Si hyperhemispherical lenses are used to improve the outcoupling efficiency of the THz radiation generated in the GaAs substrate of the photoconducting dipoles into the free space. Additionally, off-axis parabolic mirrors are used to focus THz radiation to the sample. Fig. 4 Transmission and reflection modules. "T-Spec" has two modules: transmission (Fig. 2a) and 0 angle reflection (Fig. 2b). Exchange of the modules takes no more than a few seconds and no additional alignment is needed. 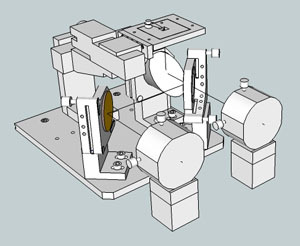 On both modules, XY stage, with scanning range of 25x25mm, can be used for imaging experiments. 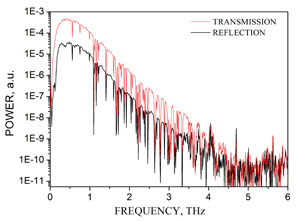 FFT spectrum of the measured THz pulse transients can reach up to 4 THz (Fig. 3). 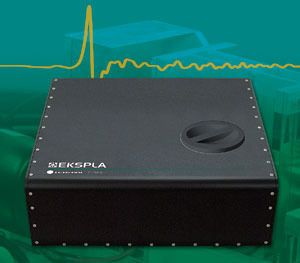 Powders and liquids can be characterized in both configurations using standard optical spectroscopy cells. Fig. 5 Comparison of the FFT spectrum in transmission and reflection configurations. 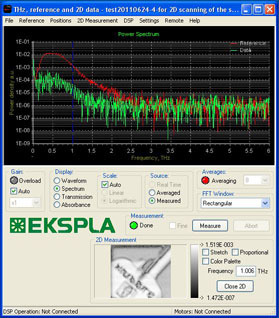 The use of the instruments described above is free of charge under the self-service basis. In case of the experiments on request 100 EUR/day charge will apply (one working day is minimum). All the conditions of the experiment and the results will be briefly reported (3-10 p. report). Number of the samples measured per one working day depends on the experiment, for example: 1 sample per day if optical pump-THz probe measurement is done in low temperature (10-270 K) or 5-7 samples if in room temperature; for spectroscopy experiments, measurement speed is approximately 5 samples/hour. Imaging speed depends on the number of pixels. For example 10 000 pixels image of the shaving blade (Fig. 1 software window) can be done in approximately 2 hours (time includes sample preparation, positioning etc.). For special experimental conditions please contact us directly.